A splendid book of stories that ravish and ennoble and hearten, even as the news remains bad. Falco has more talent than ought to be legal or mortal. I can't imagine a better book of stories will be published this year. A complex, gripping, and astoundingly fulfilling work. One way to describe Burning Man collectively, though, is as a decidedly post-9/11 work, perhaps even one of the first of its kind. Plenty of books have either prescriptively or descriptively discussed the attacks on the United States, and some have even done so in a literary sense. However, Falco seems to weave the post-9/11 mentality into his scenes and characters. "The Athlete" [from Burning Man] is a piece of sure writing from someone who writes like a master of the form.
. . . it’s the characters that really matter here. Their wants. Their fears. The psychological forces that compel them into their curious predicaments. And no matter how grim those predicaments may be—whether we’re watching two survivors of a nightclub bombing play chess, or we’re heading into the Nevada desert for one of the most infamous music festivals in the country—it is impossible not to follow these characters’ every step. At once gritty and visionary, Falco’s stories combine the nerve and edge of classic noir fiction with a transcendent lyricism. This synthesis––of the sinister and immanent, evil and sublime––gives his work its indelible emotional depth and uncanny resonance. The sensibility is somewhat akin to that of Chandler or Carver, yet Falco’s fiction is as distinctive as it is mesmerizing. No one has written anything quite like these deeply engrossing, lovely-harrowing stories. As much as I love some of Falco’s earlier work--stories like ‘Gifts,’ for instance, or ‘Silver Dollars,’ which seem to be among the most powerful fiction of the last quarter-century--in this new book he's taken his work to even greater heights. The title story is a stunner, and so are several others. But frankly, there's no point in my directing readers to the highlights. The highlight is the collection itself. The single-best story I’ve read so far this year is the title piece to Ed Falco’s Burning Man . . .
--Nick Kocz, "Nick Kocz's Ridiculous Words"
Falco remains one of the most powerful short fiction writers of his generation. These 11 stories mark Falco's fourth collection and contain tales of struggle, moments of humor and sadness and, most of all, a lyricism not often found in American literature . . . Burning Man is a lean, forthright, often devastating examination of our ineluctable longing for beauty and truth. 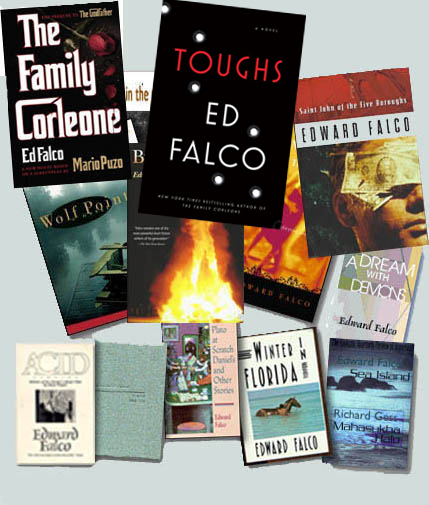 Ed Falco is an enchanter who casts his spell with what Ford Madox Ford called the ‘fresh usual word,’ with impeccable sentences, and with unerring and exquisite details. These unsettling explorations of men at a dangerous age, whose quiet lives are often haunted and shaped by loss, are savvy, fearless, and achingly beautiful. 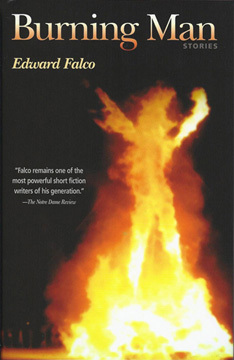 Burning Man represents Ed Falco at the height of his considerable narrative powers. What talent, what nerve, what a wondrous and spellbinding collection. —John Dufresne, author of Requiem, Mass. Burning Man is a smart, wicked, funny, sad collection of stories from one of our wisest writers. Burning Man is a high octane collection: the endlessly rich material of love and loss, the perfect pitch of Falco’s tone, the engaging plotting, the immediacy and danger of the subject matter, all make for a great read. Falco's masterful, electric prose is mesmerizing, beguiling in its appararent simplicity. Underlying the words is a formidable intelligence, an artist in control of his story and his aesthetic. The collection is additional evidence that Falco is a skilled writer, one of the best of his generation.